When you think of a holiday plant, poinsettias jump to mind. Unlike the poinsettia, there is one showy plant that reblooms annually with just a little care: the holiday cactus. Cactus plants conjure up visions of deserts and spines, but the holiday cactus is a spineless cactus with very showy blooms. The holiday cactus is in the Schlumbergera family, a small family of cactus with only six species, including the holiday cactus Schlumbergera truncata and the true Christmas cactus Schlumbergera x buckleyi. Schlumbergera truncata, (synonymous with zygocactus) is the cactus marketed as holiday cactus. If it is in bloom in November, we call it a Thanksgiving cactus; if it is in bloom in December, we call it a Christmas cactus. It is also called crab or claw cactus because of the crab-like appendages on the flat leaf-like segments. The true Christmas cactus, Schlumbergera x buckleyi, can be a bit more difficult to get into bloom, so it is less popular. Schlumbergera are true cacti native to Brazil. This family of cacti are epiphytic plants found growing in the rain forest, sharing space with orchids and bromeliads, not in sandy, dry deserts. Epiphytes are plants that root and perch on other plants or nonliving objects. These plants have wide, flat, segmented, succulent, leaf-like branches and produce colorful multi-petaled flowers in red, purple, peach, orange, pinks and creams. 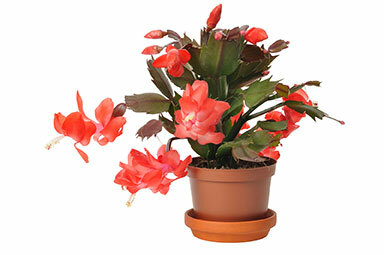 The holiday cactus blooming is affected by day-length and temperature. The secret of good blooms is to maintain proper temperature and light control, especially temperature. Buds will develop and bloom if given bright light and short days (less than 12 hours of light per day), and night temperatures less than 70 degrees, (preferably between 55 and 65 degrees). If they are left outdoors in the fall, they get the shorter days and cooler temperatures naturally, and set a copious amount of flower buds. If the temperature is lower than 55-60 degrees (but not below freezing), plants set flower buds regardless of the length of the day or night, and might re-bloom in February and March. The plants should never be exposed to freezing temperatures. After exposure to cool temperatures and short days for six weeks, flower buds are produced. If you treat your plant as a houseplant year-round and keep your house at 70 degrees or above, you will probably never see a bloom. It needs the cool period to set flower buds. You may hear a dry period in the fall is necessary for reblooms. Many researchers have looked at this practice and found it decreases blooms. This cactus doesn’t like its soil to get bone-dry or water-logged. Water thoroughly, but allow it to become moderately dry between watering. Use a lightweight, well-drained potting soil. Holiday cacti bloom best when they are slightly pot-bound. Repotting is necessary only about once every two to three years. When repotting, gradually increase the pot size. As the blooms develop, give the plant a bright sunny window, but watch for flower buds dropping off if the temperature is too high or humidity is too low. After the plant finishes blooming, place it in a room where it can receive some direct light. Full sun is beneficial in midwinter indoors, but full sun during summer months can make plants look pale and yellow. These plants grow naturally outdoors shaded by a canopy of leaves. If you have older plants that haven’t bloomed yet this year and have no sign of flower buds, or your cactus has already finished blooming and you would like more flowers, move the plant to a very cool room in your house that gets bright light, or place them near a cool window. Even a sun porch or garage with a window may work — as long as they don’t freeze. In the summer, move the plant outside where it will get full morning sun and afternoon shade, especially during the hottest months of the summer. Most of the growing is done between April and September. Keep the plants evenly moist and fertilize monthly during this period. Holiday cactus plants are relatively disease- and insect-free. Recent development of vigorous new hybrids, offering a wide range of flower colors, has increased their popularity and availability. They are a welcome gift to give and receive and with just a bit of care, can keep giving year after year.